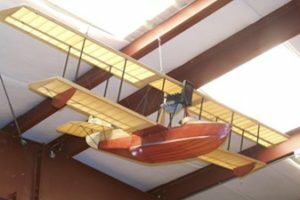 This model represents a family of early flying boats developed in the United States in the years leading up to World War I. These airplanes were biplane flying boats powered by a single engine mounted among the interplane struts and driving a pusher propeller. The pilot and passenger sat side by side in an open cockpit. The first flight of this family of aircraft took place in 1912.